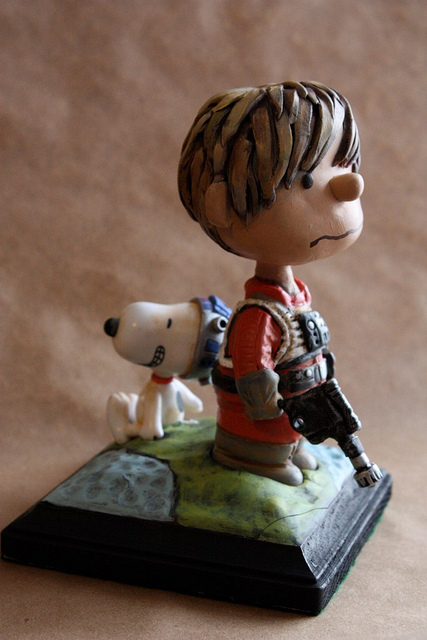 Tom Torrey made this rad sculpture mash-up of Star Wars and Charlie Brown. Here you see Charlie Skywalker with his trusty companion Snoopy with an R2-D2 skull cap reminiscent of Tron Guy’s helmet. The look of despair on Charlie’s face paired with the inappropriate excitement of Snoopy is a perfect nod to the Peanuts legacy. Also, the detail of Charlie’s flight suit. Oh! And his blaster! This is definitely one rad mash-up. Happy Winter Solstice! Yay! Days are getting longer now!